One of the first things that attracted us to this old house was the windows. The house may be on the smaller side of life, but it is brightbrightbright, because of the numerous and very large windows scattered throughout our home. Now, however, what started out as a beautiful and attractive feature is quickly becoming a pain in my backside, and something needs to be done - fast. 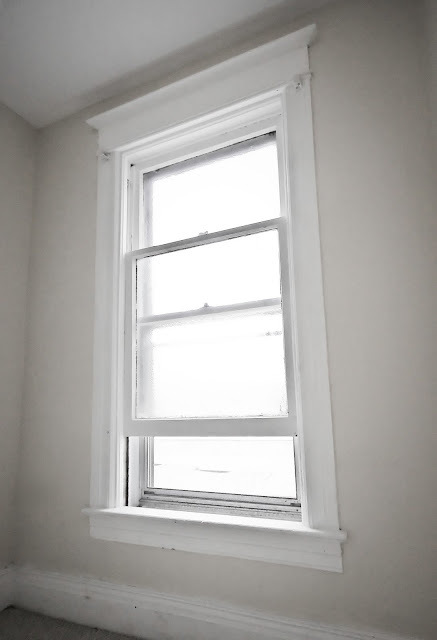 The problem becomes complicated by the fact that I don't really want to do anything with the windows, and mostly I'd just like to leave them the way they are, showing off their beautiful trim and crown moulding. Check it out...so pretty, no? The window at the top of the stairs. So dreamy...until you see the parking lot right outside. However, I also don't want to look into my neighbor's kitchen when I come out of the bathroom, you know what I mean? Right now there are really, really not-so-pretty plastic blinds on the bedroom windows, and I'd like them to be gone, like yesterday. It sounds like it should be a relatively easy task to take out the blinds and replace them with something modern and stylish, like a printed roman or inside-mounted roller shade - but again, it's a little more complicated than that. That little complication comes in the form of two angelic cherubs who, given the opportunity, will wake up at the bumcrack of dawn if even so much as a sliver of light enters their room, at the right angle, at the EXACT WRONG time. In our house, bedtime is a complicated ritual that involves bizzare light-eliminating acts from every single nook, cranny, crevice, gap, and crack...everywhere. We basically walk around smoothing down every bumpy surface around the windows and doors, and then cross our hearts and hope to die, stick a needle in our eye and pray to the heavens above to not be woken up at 5am by two little people who don't NEED TO SLEEP IN ORDER TO SURVIVE. They freak me out, man. Especially when they're staring at me with their wide, non-sleepy eyes and their heavy, non-sleepy breath and saying, "Mama! MAMA! Look...I can see the light! The light...the light...I must go towards the light....."
Okay, maybe they don't say that last part, but the fact is that my kids have an uncanny knack of sensing daylight and it must be constantly quenched in order for me to function like a marginally normal, occasionally-twitching human being. Enter my design dilemma: Do there exist pretty shades that a) show off my GORGEOUS window casing, and b) keep bedrooms so dark that you can't see your own hand in front of your face? Yousuf thinks that we should go with cellular shades...but honestly, I find them to be a bit boo-ooring. But, I think I could learn to live with them if they really are all that and a can of beans at keeping out light. I need your advice, oh wise and sage internet readers! What's a sleep-deprived, yet style-hungry mama to do?? ?